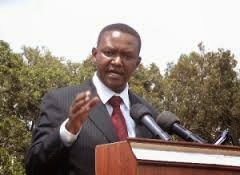 : WILL MUTUA BE THE FIRST GUV IN THE DOCK? Machakos governor Alfred Mutua is feeling political heat as Ethics and Anti-Corruption Commission sleuths lay grounds for his prosecution over financial impropriety, misuse of office and flouting procurement procedures. This also comes in the wake of heightened bad blood between him and his deputy Bernard Kiala after Kiala’s push and spirited onslaught to have Mutua fire two senior officers who are allegedly running corrupt cartels. Although the governor went to court to have an injunction barring EACC from summoning him to shed light on how the county acquired second-hand vehicles, his deputy appeared before EACC last week where he was grilled for three hours. The vehicle acquisition syndicate is one amongst hundred files in the tables of the anti-graft body. So far EACC has recorded statements from Mutua’s county executive, transport manager, transitional authority and the proprietor of Extreme Auto Dealers who was the supplier of the vehicles. Sources indicate that the first informal cabinet meeting was held on April 16 2013 and chaired by the governor himself. By that time, according to a member of the cabinet who sought anonymity, there was no tender committee in place to facilitate procurement of the said vehicles. During the same cabinet meeting, it also emerged that the meeting was attended by outsiders who were not gazetted as employees of the county government. They included Ken Wathome, John Kasyoka, Francis Mwaka who later became county secretary and Mwengi Mutuse later became chief of staff. After the cabinet meeting , outside Mutua’s office, his executive were lined up and allocated each a Subaru Outback car while the governor boarded Toyota VX. According to statement by transport manager, he received the cars on April 18 2013. The procurement committee was formed on April 19 2013 and was backdated and endorsed singlesourcing of 15 Subaru and Toyota for the governor. The cost of a Subaru was Sh1.7 million and Sh6.5 million for the Toyota amounting to Sh32 million in total. The director of Extreme Auto was paid Sh32 million on May 3 2013 and on May 4 withdrew Sh7 million to pay for a kickback to senior aide of the governor. The transaction according to EACC never followed the due procedure and public might have lost money in the deal. EACC is also pinning down the governor who is the accounting officer of the county on how procurement of tractors, fertilizers, Machakos People’s Park, renovation and upgrading of Kenyatta Stadium with word that all were singlesourced and awarded to proxies or companies associated with Mwengi. Personal accounts for the governor are also monitored and private investment he initiated upon assuming office under the microscopic eye of the EACC sleuths. For instance, the anti-graft body is scrutinising a Sh60 million hotel complex allegedly being built by the governor in Tsavo West National Park. During a cabinet meeting held at the governor’s office where his deputy was ejected, Mutua is said to have instructed his county executive to nail his deputy and eventually work on how to impeach him in fear that if he is charged, his deputy may take-up the mantle and implicate all of them in the scam. It is said the governor is more comfortable with the county speaker Bernard Mung’ata taking over the county in case of worst scenario emerges. The governor is also facing a revolt from employees who have not been paid since January. Devolved health workers are also in arms against the county government for failing to absorb them. It is said that no polio jabs have been given in Machakos since health was devolved. The much-famed police vehicles Mutua unveiled are now being used as taxis by the drivers who have not been paid since February.